Coeckelbergh, M., Loh, J., Funk, M., Seibt, J., Nørskov, M.
Robots are predicted to play a role in many aspects of our lives in the future, affecting work, personal relationships, education, business, law, medicine and the arts. As they become increasingly intelligent, autonomous, and communicative, they will be able to function in ever more complex physical and social surroundings, transforming the practices, organizations, and societies in which they are embedded. 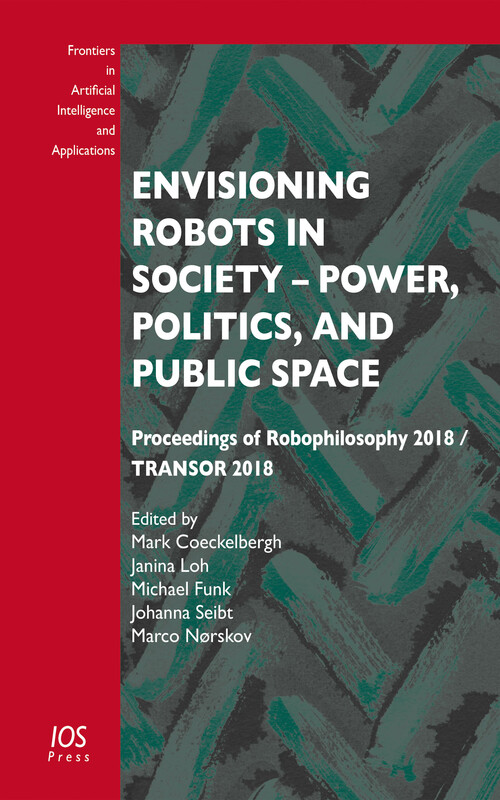 This book presents the proceedings of the Robophilosophy 2018 conference, held in Vienna, Austria, from 14 to 7 February 2018. The third event in the Robophilosophy Conference Series, the conference was entitled Envisioning Robots in Society – Politics, Power, and Public Space. It focused on the societal, economic, and political issues related to social robotics. The book is divided into two parts and an Epilogue. Part I, entitled Keynotes, contains abstracts of the keynotes and two longer papers. Part II is divided into 7 subject sections containing 37 papers. Subjects covered include robots in public spaces; politics and law; work and business; military robotics; and policy. The book provides an overview of the questions, answers, and approaches that are currently at the heart of both academic and public discussions. The contributions collected here will be of interest to researchers and policy makers alike, as well as other stakeholders.